Our virtual doors (the appearance of the inlinkz button) open here in North America at 19:00 hours every Thursday. That means that those of you across the oceans, for whom it is already Friday, can actually link up on what is Friday for you! If you are new to Photo Art Friday, please read the guidelines for participation by clicking on the Photo Art Friday tab under my header. This week, the optional challenge is to share a piece of photo art that you have created using images from your archives, paired with the texture pdpa Leafy Landscape. If you did not get to download the high res version of the background/texture you can find it in this post. To make my submission for this week's edition of PAF, I used the texture/background, Leafy Landscape as my canvas and added the above texture from my personal archives. 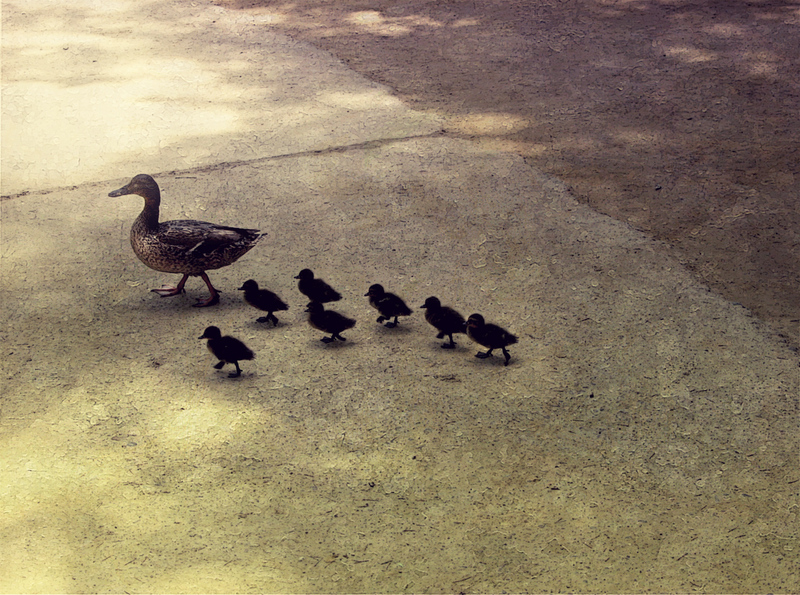 I then dropped in the digitally enhanced photo (taken by my son-in-law while in Spain) of a mother duck and her baby ducklings. Wanting to make it appear that the group of ducks had just emerged from a body of water, I used the brush tool to paint in some blue at the base of the scene. Poster Edges were added. 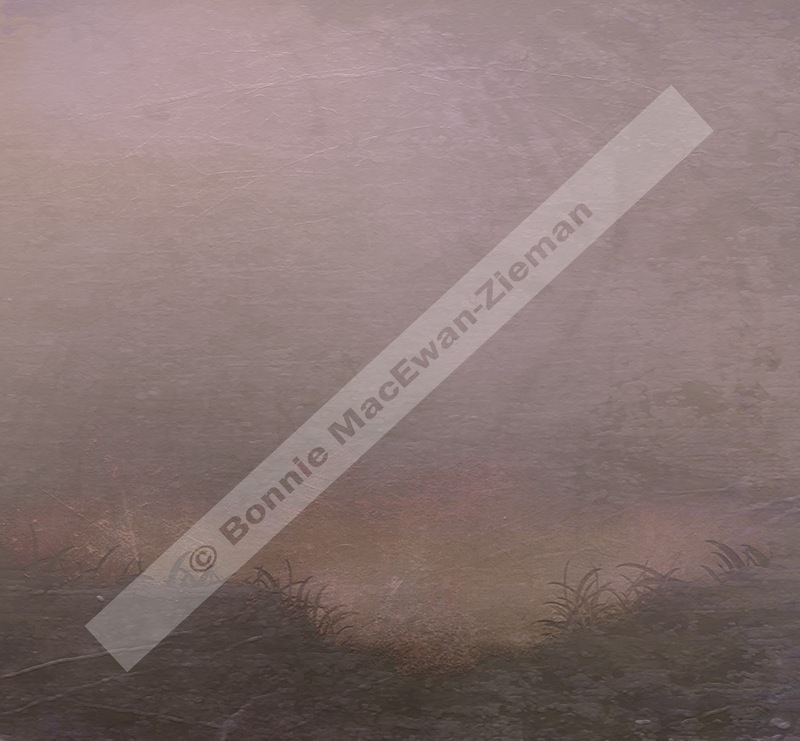 When making a composite, I find that a soft application of the filter 'poster edges' somehow marries all the elements in the composite together. A couple of 'stylets' were added in RadLab to slightly enhance the overall appearance. The addition of my signature was the last step, and we were good to go! What do you think? Click to enjoy an enlarged view. left or deserted, as by the owner or guardian; abandoned. neglectful of duty; delinquent; negligent. a person abandoned by society, especially a person without a permanent home and means of support; vagrant. Nautical . a vessel abandoned in open water by its crew without any hope or intention of returning. personal property abandoned or thrown away by the owner. Thanks, Bonnie. Generally, I don't have many animal images, but I had one that worked just fine with the new texture. Can't wait to link up! 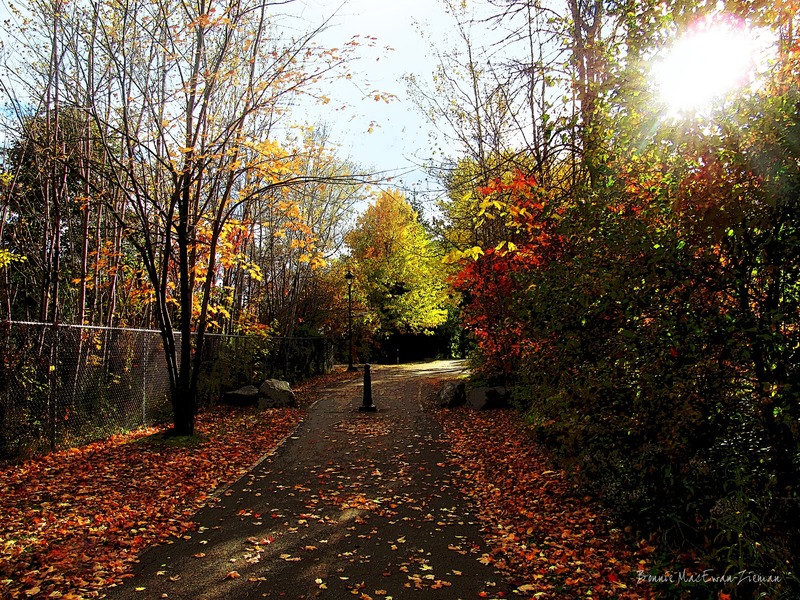 What a beautiful path Bonnie...I can imagine its beauty in each season and in transition from one to the next! Very cool work with the ducks and textures! So totally gorgeous, Bonnie. I'd love to walk with you here. Very cool way to play, Bonnie!! I never cease to BE amazed and encouraged by what you share and invite. I am so glad for this going on this evening as it gives me an oasis of simple calm and genuine fun to defuse a crazy past 24 hours. I am going to try playing this way with textures, too. It is quite a dance!! 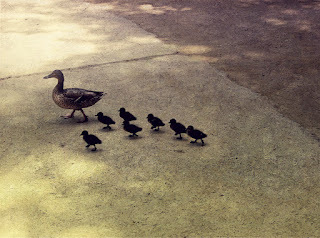 What an amazing piece of art with your mama duck and her babies and your gorgeous texture. Hi Bonnie, love how the ducks are travelling through the photo. I hope you don't mind I borrowed your bird theme this week. Lovely result! It's almost like the texture was made for the picture. That piece is amazing, Bonnie! It could hang on the wall in a museum. And it's nice to see you have some colour in Eastern Canada, here in the west, the wind took all our leaves before that glorious 3 or 4 days of colour we usually have! love what you've done with it Bonnie. i found it interesting to work with and did something a little ghoulish . . .
Lovely work! Beautiful place too! I haven't done anything with your texture, but I am so curious to see what everybody came up with!!! by the way, can't stop looking at that beautiful path of yours... what a beautiful place!!! Your mama duck with her babies is just wonderful Bonnie. Thank you for the new texture. Great picture of the duck family! Bonnie I absolutely love your combination of these two textures and these adorable ducks! I think that you are so talented and wish I had that ability to "see" how how to combine all of the elements digitally to make a "finished project". Are you familiar with a magazine SOMERSET DIGITAL STUDIO. I think it would be a great magazine for you to be published in.... If you cannot find it in Canada, I would be glad to mail you one, although i know it is also available digitally. Think you should enter some of your work.... You would be a shoe in! Have a wonderful day! I had not though of making the landscape a scene (!) but your ducks look so good under the willow tree. Thank you for this texture - it inspired a whole forest I'm afraid! 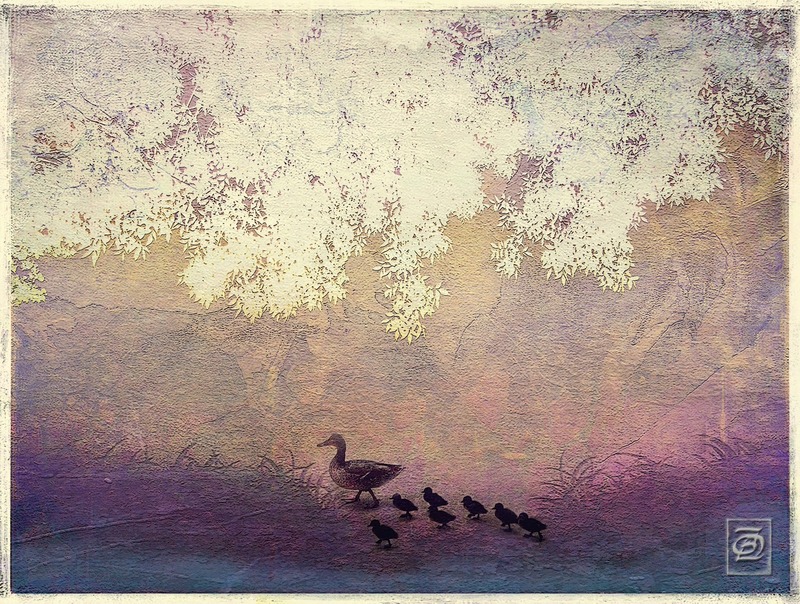 I love the way you used this texture with the shot of the ducks. Thanks for the texture - it could be used in so many different way. Love your ducks! You have given the duck family a lovely leafy environment. 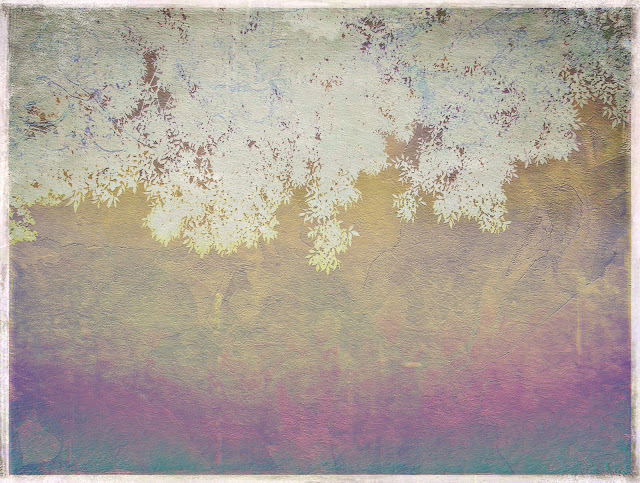 And thanks for the texture - my first time trying this- i hope you can still see it! Wonderful piece Bonnie. I love the sweet feel it has. - This was a cool texture. I'll need to experiment with it more. Gorgeous path you walk on, such wonderful fall color. Wow PAF has had some great participation recently. Yes, an impressive way with leaves, very autumnal, I like it, great!. I want to walk around. Greetings. ducks on parade - sweet! this is what I like. You made a texture to suit your photo of the ducks. Really nice work.